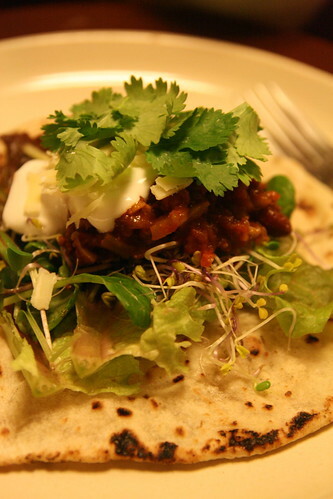 With a few friends coming round on Monday night for dinner, I couldn't decide what to make. I'd normally put together a lasagna, some ribs or a selection of pastas; but I wasn't in the mood. It was cold and I wanted something a little spicier... Then it hit me, if Dos Tacos can throw together a burrito then why can't I? 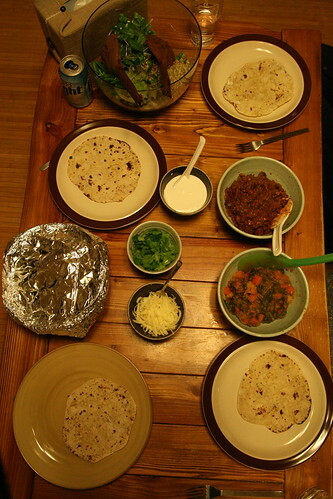 I whipped up a batch of chili con carne, picked some coriander, grated some cheese, spooned out the sour cream, threw together a simple vegetable curry and coerced my wife into making chapatis (After years working as a props designer/basket weaver, she's a natural at making flatbreads).